We Manufacture and Export the high merit of different Wood Cutting Tools like Circular Saw Blade, Hand Saw Blades, Chain Saw and many more. You cannot ignore the name Sanjeev Kumar and Brothers, when searching for the peak Circular Saw Blade manufacturers and exporters. The galaxy of our Wood Cutting Tools contains high ranked products, that have been classified on the basis of their sizes and other specifications as well. Band Saw Blades Manufactured by us is one of the best wood cutting saw present in the market. Our band saw blades ranges from different widths to different thickness and lengths. This provides you with more options to choose from. Superior quality materials are used by us to manufacture these top class band saw blades. 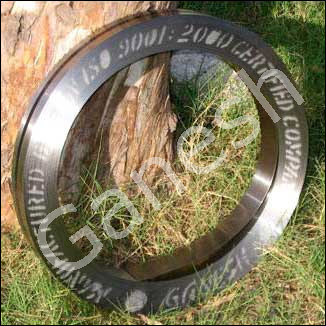 Manufactured from Hardened & Tempered High/Medium Carbon Alloy Steel and Nickel Chrome Steel Strips. Size Range : Narrow Band Saw Blade-10mm and goes up to 76mm wide. Wider Band Saw Blade- From 57mm up to 260mm wide. Teeth* : Cross Cut teeth and Ripping teeth. T.P.I. * : 1 to 5. (*) Sizes and teeth shape can also be provided as per customers' requirement. The above table indicates the sizes which we have already provided/providing to our customers. We can provide various types of stamps on the blades like etching black colour stamp, stickers, etc. We have the option of providing our customers with BLUE COLOUR STAMP on the blades with sizes and batch number printed along with the brand names. This stamp is imprinted on the band saw blade by computerized printers, which leave its prints at regular specified intervals. Due to the high end computerized stamping machine we are able to give accurate and clear stamps at the required distance with various types of other descriptions. Please see below the picture of this stamp.